Strauss Capital Partners’ management team has played a leading financial advisory role in numerous transactions over a period of more than 25 years. Our many completed transactions attest to our ability to meet the needs of our clients -- time and time again. The Door is a leading lifestyle and hospitality public relations, creative branding, and marketing services agency, that the New York Observer recently listed as the fourth most powerful PR firm in the United States. The firm boasts a formidable client list that ranges from celebrity chefs such as Rachael Ray to hotel groups such as Viceroy Hotels and Resorts to restaurant groups such as Starr Restaurants to consumer brands such as FAO Schwarz. Strauss Capital advised the company as its owners were contemplating a sale after receiving several unsolicited offers. Dolphin Entertainment (NASDAQ: DLPN) is a leading independent entertainment marketing and premium content development company. Through its subsidiaries, it provides expert strategic marketing and publicity services to many of the top brands, both individual and corporate, in the entertainment and hospitality industries. The company’s content production business is a long-established, leading independent producer, producing original feature films and digital programming primarily aimed at family and young adult markets. Sale to Houlihan’s Restaurants, Inc.
A.C.E. Restaurant Group has been a highly-respected operator of Houlihan’s restaurants in New Jersey and New York for almost 20 years. Opening its first Houlihan’s restaurant in 1998, the Company grew to operate a total of 18 units, becoming the most successful franchisee in the Houlihan’s system. Strauss Capital assisted the company’s President, and a major shareholder, in contemplation of a management buyout or possible sale. In March 2018, A.C.E. was sold to Houlihan’s Restaurant Group, based in Kansas City, which owns several restaurant concepts in addition to Houlihan’s, including Bristol Seafood Grill, Devon Seafood + Steaks and J. Gilbert’s Wood-Fired Grill. Customer Cable Solutions, Inc. (“CCSI”), together with its women-owned affiliate, Maryland Integrated Systems, Inc. (“MISI”), both located in Salisbury, Maryland, is a privately-held manufacturer of new and custom interconnection products, principally cable harnesses and wiring systems, for aircraft, ground support vehicles, transportation and telecommunications for military application. Strauss Capital has been an advisor to the companies’ sole shareholder, as well as advisor to an affiliated company, a manufacturer of connectors for military use, for many years. CDM Electronics, headquartered in New Jersey and with regional branch offices in CA and TX, is a major distributor of interconnect products and provider of value added services, serving the aerospace, military and communication industries, among others. RH Sheppard, founded in 1937, based in Hanover, PA, and employing more than 900 persons, is a key tier-one supplier of industry-leading steering capabilities and technologies for commercial vehicles. Its suite of power-steering gears has set the industry standard for heavy-duty commercial and specialty vehicles. WABCO Holdings, based in Brussels, Belgium, is a leading supplier of technologies and services that improve the safety, efficiency and connectivity of commercial vehicles. The combination of WABCO’s and RH Sheppard’s technologies, including active steering, active braking, electronic stability and suspension control and other advanced driver assistance systems, is a key milestone in enabling the commercial vehicle industry's path towards realizing fully autonomous driving. Ventacity, based in Portland, Oregon, designs and sells next-generation intelligent ventilation systems for the small and medium commercial building market. The company’s ultra-efficient Heat and Energy Recovery Ventilators (HRVs and ERVs), are part of a system that can save buildings over 60% of their Heating, Ventilation, and Air Conditioning (“HVAC”) energy consumption and make the building Indoor Air Quality (“IAQ”) healthier. Ventacity is seeking to capture and replace part of the market for roof-top units (RTUs), of which 1+ million are shipped annually to retrofit, and for new, small and medium commercial buildings. Strauss Capital provided financial advisory services to Ventacity in connection with the company’s $2 million convertible Series A Preferred financing. Acquisition of the assets of Littleford Day Inc.
B&P, founded in 1889 and based in Saginaw, MI, is the manufacturer of Baker Perkins® machinery, including batch mixers, extruders and centrifuges. The company maintains a leadership position in both batch and continuous mixing for industrial applications, serving the pharmaceutical, chemical, food, plastics, animal nutrition and coatings industries, among others. Its acquisition of the assets of Littleford Day, a well-established and well-recognized company based in Florence, KY, with a complementary line of mixing, drying and reacting equipment, will strengthen B&P’s product offering to the markets it serves, further increases B&P’s share in the industrial mixer market and should result in manufacturing efficiencies and product improvements across the companies’ product lines. Acquired by B. Braun Medical Inc. The Sterile Solutions Manufacturing Operations of Baxter International, in Daytona Beach, Florida, is a world-class device and pharmaceutical manufacturer of fluids in flexible bags, used primarily for continuous renal replacement therapy for the treatment of acute renal failure. Having served several companies engaged in the manufacture of pharmaceuticals in flexible packaging, Strauss Capital was initially engaged by Gambro Renal Products, Inc. to assist with this divestiture. Prior to completion of the transaction, Gambro was acquired by Baxter in a $4.0 billion transaction. Subsequently, Strauss Capital continued to advise Baxter on the sale. Baxter (NYSE: BAX) is a $16.8 billion revenue pharmaceutical company, based in Deerfield, IL, that develops, manufactures, and markets products for people with hemophilia, immune disorders, infectious diseases, kidney diseases, trauma, and other chronic and acute medical conditions. B. Braun Medical Inc. the U.S. subsidiary of B. Braun Melsungen AG, is a $6.4 billion revenue pharmaceutical company based in Germany that develops, manufactures, and markets products for people with hemophilia, immune disorders, infectious diseases, kidney diseases, trauma, and other chronic and acute medical conditions. Conduce, based in Santa Barbara, CA, is an enterprise software company for the Big Data segment. Its powerful data handling technology allows enterprises to access and manage vast amounts of data, from any variety of sources, in a completely new way. Its technology unifies that data into a single, intuitive visual interface, without requiring any integration. It allows users not just to find information, but also to discover its significance and act on it quickly. Much of what Conduce has been doing relates to the burgeoning field of the Internet of Things. See: www.conduce.com. Strauss Capital provided financial advisory services to Conduce in connection with both its initial round of financing in late 2013 and a Seed Round in Spring 2015. Tom Strauss was appointed to the Board of the company following the successful initial financing. The Vehicle Sensors division of Iteris, Inc encompassed a portfolio of vehicle active safety systems including lane departure warning, forward collision warning and blind spot warning, as well as SafetyDirect® software that analyzes real-time driver performance. Strauss Capital provided financial advisory services to Iteris in connection with the sale of the Vehicle Sensors business to Bendix Commercial Vehicle Systems, a member of the Knorr-Bremse Group. Bendix develops and supplies leading-edge active safety technologies, air brake charging, and control systems and components for medium- and heavy-duty trucks, tractors, trailers, buses, and other commercial vehicles throughout North America. Bendix is headquartered in Elyria, Ohio. The slimmed down Iteris, Inc. (NYSE Amex: ITI), is a leader in traffic management focused on the development and application of advanced technologies that reduce traffic congestion and improve the safety of surface transportation systems infrastructure by combining outdoor image processing, traffic engineering, and information technology. Iteris is headquartered in Santa Ana, CA with offices throughout North America and in Europe and the Middle East. Delta-Q Technologies, founded in 1999, develops and supplies power conversion solutions to vehicle manufacturers, enabling the shift away from internal combustion engines to environmentally friendly electric drive systems. The company is considered the technology benchmark in industrial AC-DC battery chargers and integrated DC-DC power converters. Delta-Q has over 500,000 units in use with customers that include some of the largest manufacturers of recreational, industrial and specialty electric drive vehicles in the world. Delta-Q is a rapidly growing, privately held company headquartered in Burnaby, BC, Canada. Strauss Capital assisted Delta-Q in raising capital to fund Delta-Q’s aggressive product development program. The company secured $17 million in funding from Tandem Expansion, a private investment firm focused on growth capital for high-potential Canadian technology companies. Delta-Q was the first investment from its $300 million Tandem Expansion Fund I, L.P.
FTI, founded in 1999, has been a fast-growing provider of ASP-based financial service applications for the bank, trust and investment management community. The company offers portfolio management, pre-trade compliance, regulatory compliance, integrated performance reporting and modeling systems to its customers in a Web services environment. Strauss Capital was engaged while FTI was contemplating the sale of the company and assisted in structuring the proposed transaction and introducing the company to other potential acquirers. SunGard, with annual revenues exceeding $4 billion, is a global leader in software and processing solutions for financial services, higher education and the public sector. SunGard also helps information-dependent enterprises of all types to ensure the continuity of their business. SunGard serves more than 25,000 customers in more than 50 countries, including the world’s 50 largest financial services companies. B2E Corporation specializes in the formulation and commercial development of environmentally neutral chemical materials that are used to protect products, people and animals. It recently launched a new line of innovative mosquito and other insect control products for the commercial market. For over a year, Strauss Capital provided general financial and strategic advisory services to B2E as it was building its business and considering a sale. During the first year of its engagement, Strauss Capital assisted in arranging debt financing for the company. 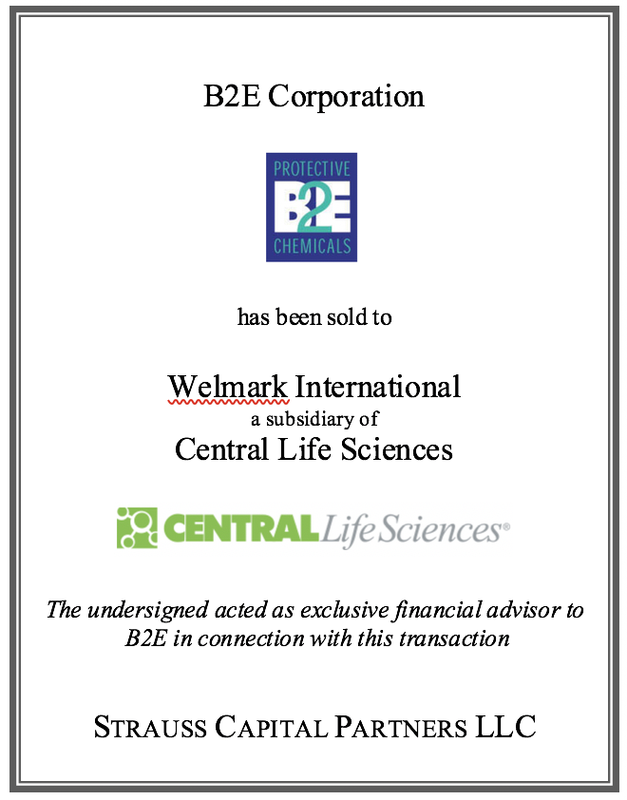 In mid-2007, B2E was sold to Wellmark, a subsidiary of Central Life Sciences. Central, founded in 1955 and based in Walnut Creek, CA, engages in the production and marketing of products for the lawn and garden, and pet supplies industries in the United States. The company, with revenues of $1.7 billion, has 4,670 employees. Strauss Capital acted as financial advisor to B2E and two related companies, B2E Biotech LLC and B2E Microbials LLC, in connection with the transaction. Dune Energy, Inc. is an independent exploration and development company, with operations focused along the Louisiana/Texas Gulf Coast and the North Texas Fort Worth Basin Barnett Shale. In 2003, members of Strauss Capital raised $1.5 million into a private partnership. That private partnership, called Dune Energy, was merged with a shell and became a public company. We then found an offshore company, Itera, which invested $20 million in Dune specifically to drill and develop certain oil and gas properties in South Texas. Subsequently, we brought Dune to the American Stock Exchange. In 2007, Dune acquired, in a $500 million transaction, the assets of Goldking Energy, so that today Dune has an enterprise value of close to $1 billion. Dune is expected to continue to exploit its existing asset base, seek accretive acquisitions, and enter into additional joint venture drilling programs. Yellow Book USA, Inc. publishes print and online yellow pages directories in the United States. The company was founded in 1930 and is based in Uniondale, NY with additional offices in Boynton Beach, Florida; Buffalo Grove, Illinois; Irvine, California; King of Prussia, Pennsylvania; Uniondale, New York; Birmingham, Alabama; and Cedar Rapids, Iowa. Management of Strauss Capital initially advised the company’s founders on the sale of the company to Three Cities Research, a New York based private equity group. Further advice was provided on behalf of Three Cities on the subsequent sale of the company to Multi-Local Media as well as on a going public transaction (IPO) led by Lehman Bros.
Headquartered in Huntsville, Alabama and founded in 1979, Sirsi Corporation develops, sells, and supports a comprehensive integrated suite of software solutions for meeting the information management and sharing needs of libraries and library users around the world. Sirsi solutions serve more than 10,000 libraries in the Americas, Europe, Africa, the Middle East, and Asia-Pacific. Strauss Capital arranged the financing, including senior debt, mezzanine debt and equity, for the purchase of the company in a $55 million LBO and structured the terms of the transaction. Founded in 1997, Seaport Capital is a private investment firm with $400 million of capital under management. With over 75 years cumulative experience investing in middle market companies, the firm provides equity capital for growth, recapitalizations and buyout opportunities for media, communications, and information and business services companies with market capitalizations under $200 million. The company, founded in Charlotte, NC in 1946 as a factor to middle-market manufacturers, was acquired by Barclays Bank PLC in 1979. At the time of its sale to CIT Group, the company had grown to become the 5th largest factor in the US based on total volume of $4.7 billion, accounting for 8.8% of total industry volume. Management of Strauss Capital provided financial advisory services in connection with its sale. Over twenty-five prospective purchasers were contacted, ultimately resulting in a winning bid by CIT to acquire the company. CIT is a leading, global source of factoring, financing and leasing capital and an advisor for companies in more than 30 industries. It manages $50 billion in assets across a diversified portfolio. CIT’s Commercial Services division, of which Barclays Commercial is the cornerstone, is today probably the largest provider of factoring, credit protection and related accounts receivable management and lending services in the world. This book publisher, founded in 1973, specializes in the publication of art reference books. It is best known for its multi-volume “The Illustrated Bartsch,” a revision of a standard reference work by Adam Bartsch on European prints from the 14th through 19th centuries. Upon the death of its founder, management of Strauss Capital provided advice, initially relating to the restructuring of the company and then relating to its sale. Services provided included identifying the purchaser and negotiating all terms of the transaction. Copyright © 2006 - 2018 by Strauss Capital Partners LLC. All rights reserved.